I haven’t written much about Eva lately, let alone shared some recent pictures. 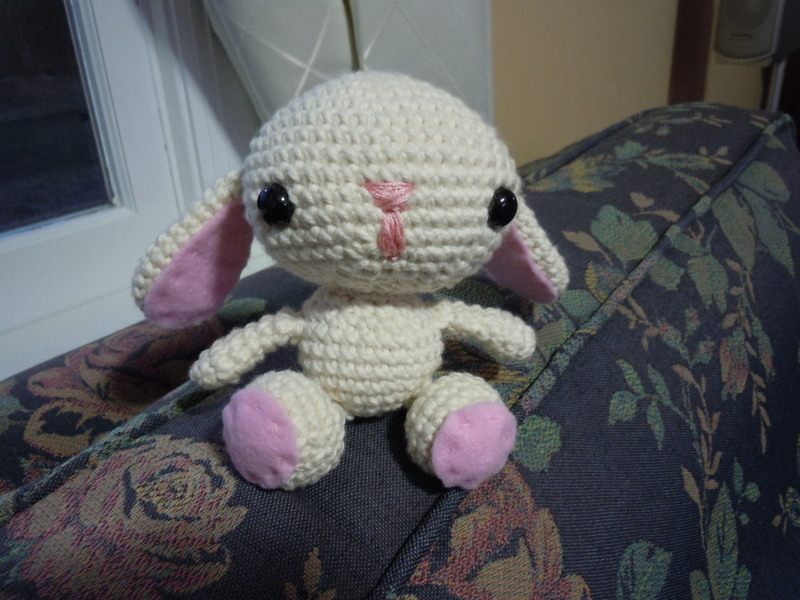 I guess I like to stick to the knitting, but sometimes I can’t resist! 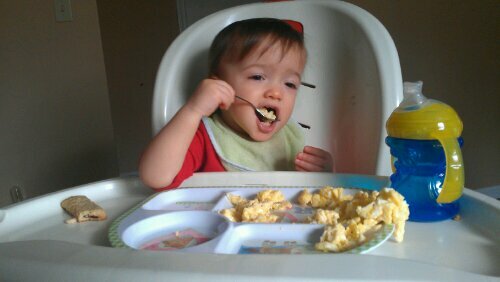 My cutie is now 16 months old. I can’t believe it. Just yesterday she was a newborn! 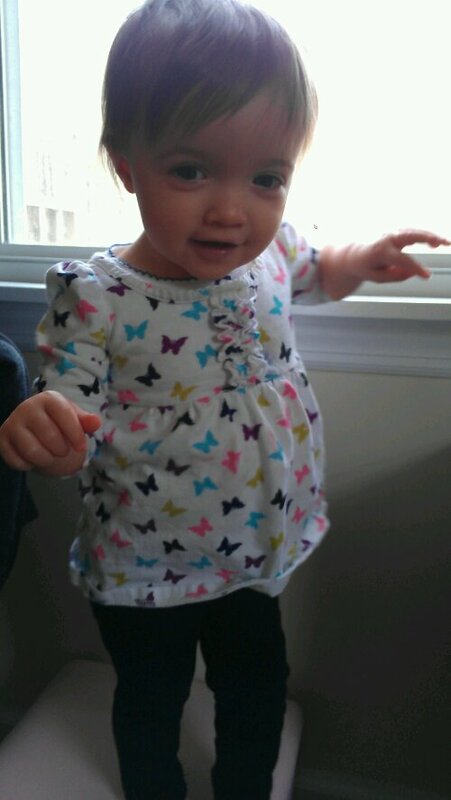 Now she’s walking, and talking (well…babbling), and being all mischievous. She’s taken a liking to testing boundaries, and I can already tell the next few years will be a challenge! 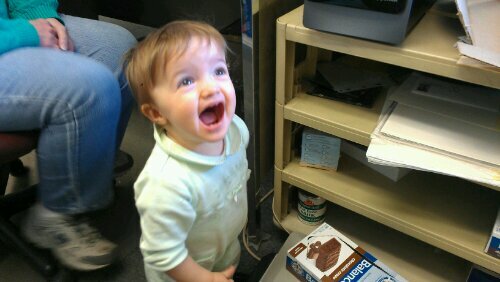 Eva's reaction to seeing her picture on the wall. Standing on her stool by the window. She likes to wave at things - people, animals, thin air. 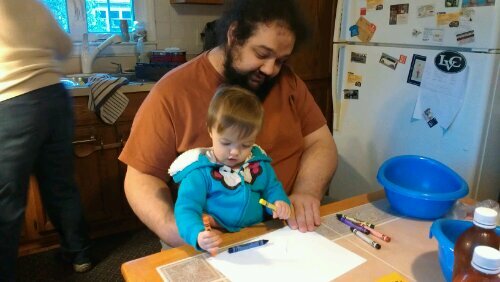 Eva drawing a picture for her Uncle Robert. 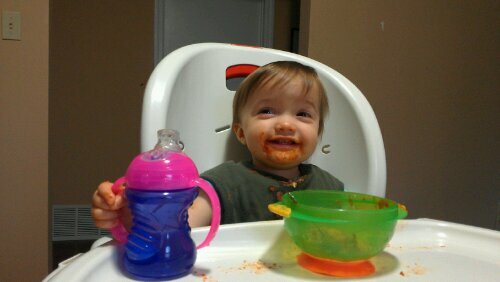 Eating pasta - her favorite! Eva sometimes acts like a civilized person. 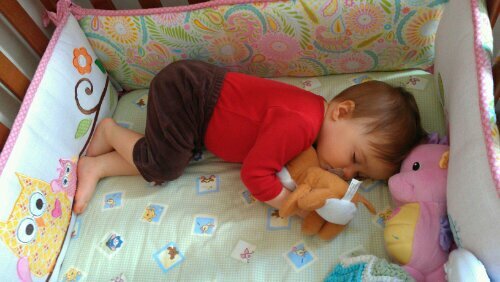 She’s been hitting all her milestones at the appropriate times and has become well adjusted to toddlerdom. 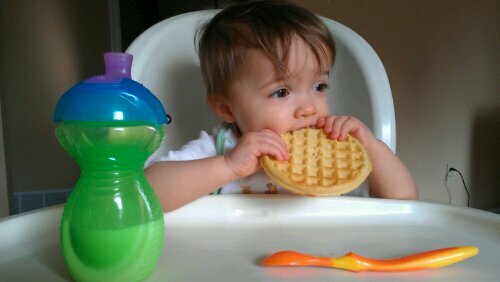 We’ve baby-proofed the house, but to occupy her time, she keeps finding new and dangerous things. She really enjoys dancing and has blossomed into quite the little performer. I hope she never becomes self conscious. Her dancing is so cute! 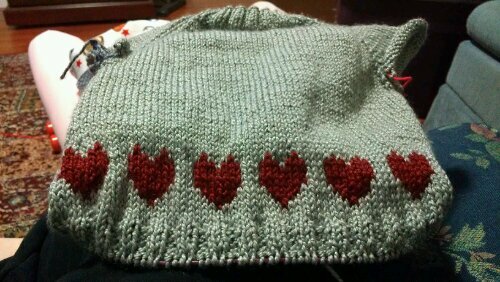 Heart Baby Hat – Complete! 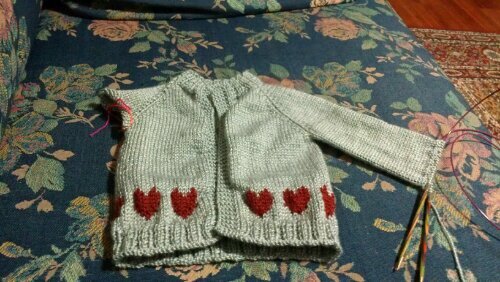 I finished Baby #2’s hat yesterday. I washed it and blocked it, and I’m pretty pleased with the results. 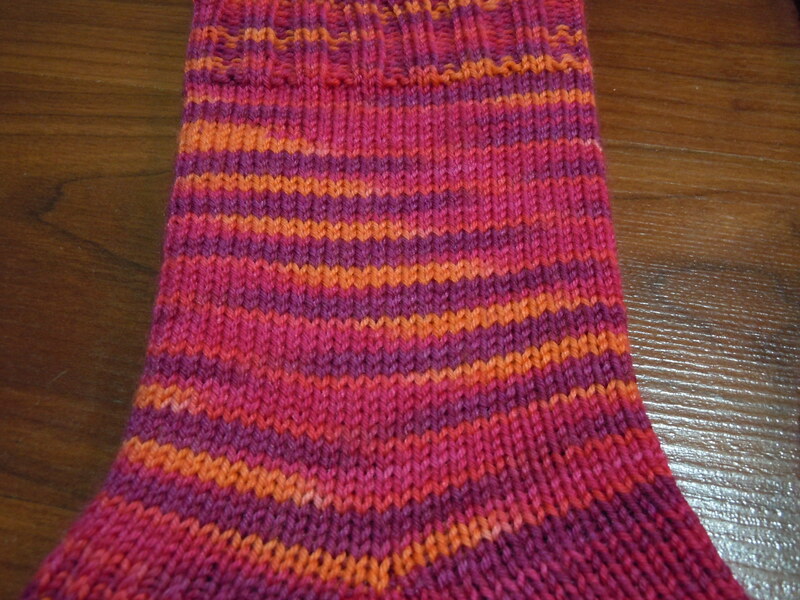 It’s a little tight in the colorwork/stranded area, but it’s not bad for my first try. Like I said before, this hat is way too big for a newborn. 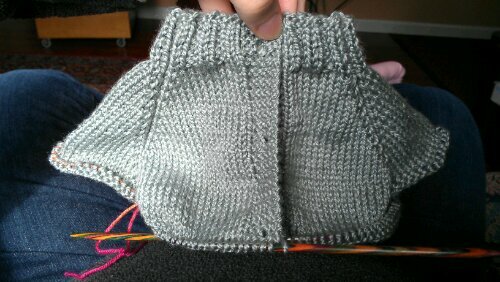 I’ve already begun seeking the *perfect* newborn baby hat pattern so that I can make something she can wear right away. In case anyone’s interested, the hat was knit on size 7 dpns with Knit Picks Galileo in “Pearl” and “Valentine.” The yarn is listed as sportweight, but I think it’s a bit heavier than that. 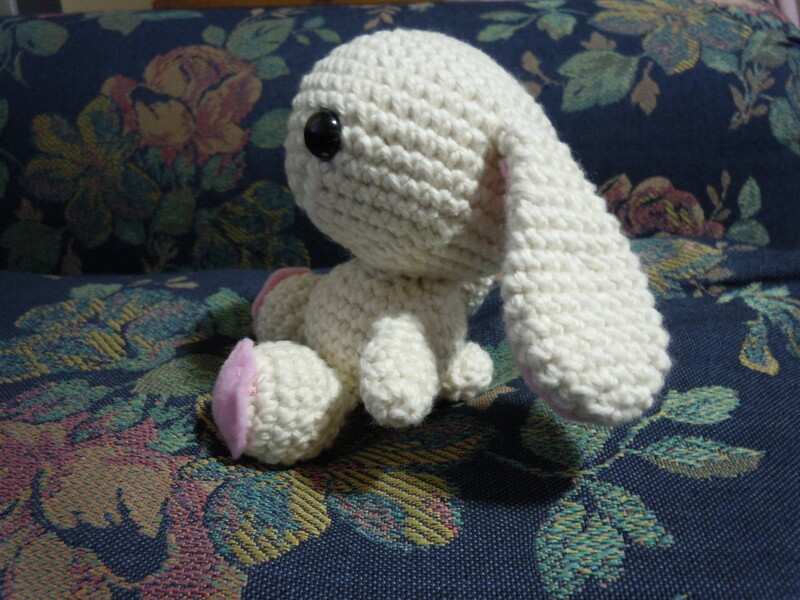 It has a nice sheen, and it’s very soft, so I think it’ll be very comfortable for Baby to wear! 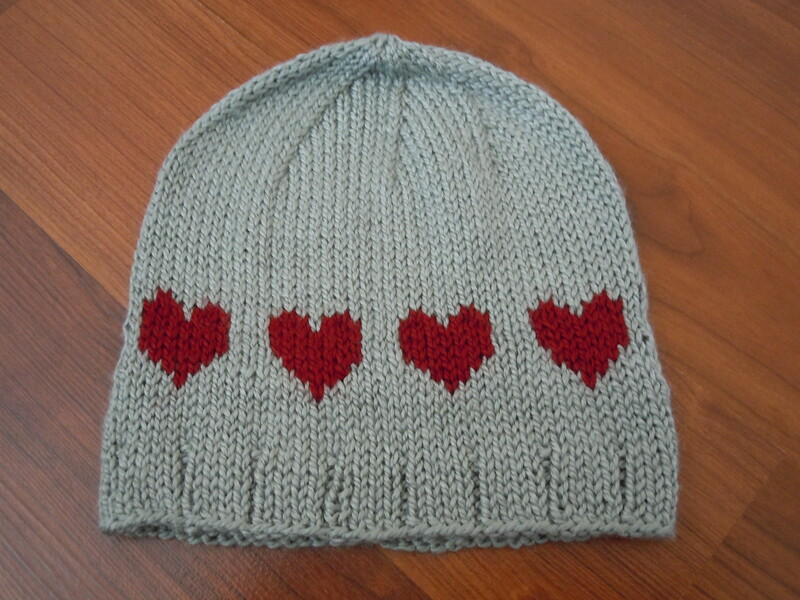 Categories: Knit | Tags: baby, bamboo, colorwork, gray, handmade, hat, knit, merino, red, silver, stranding | Permalink. 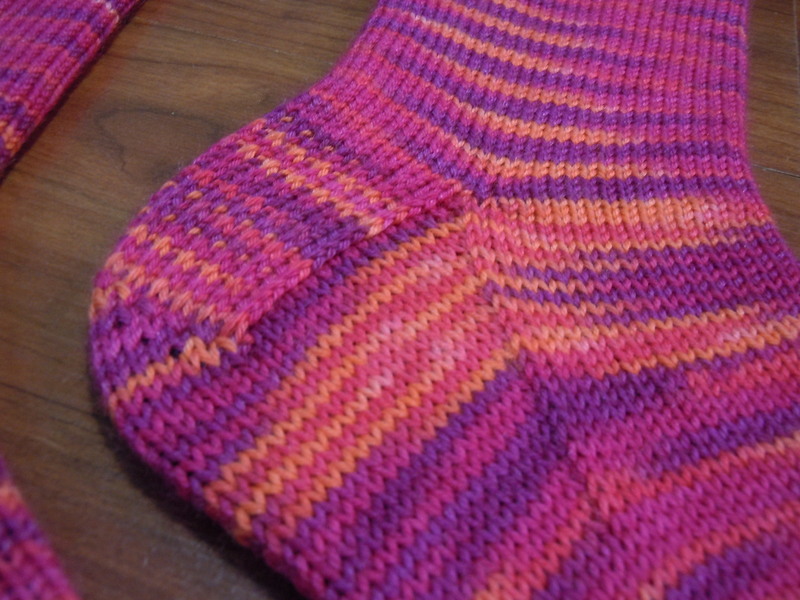 Please Don’t Pool Socks – Finished! As I mentioned in my prior post, I’ve been slacking. 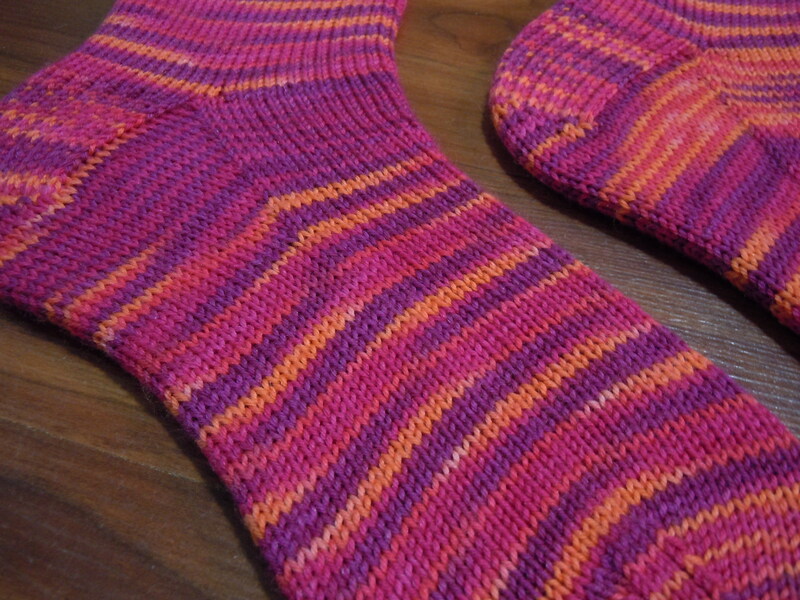 I finished these socks February 4th (according to my Rav page), and I even took pictures of them, but I neglected to write a post. 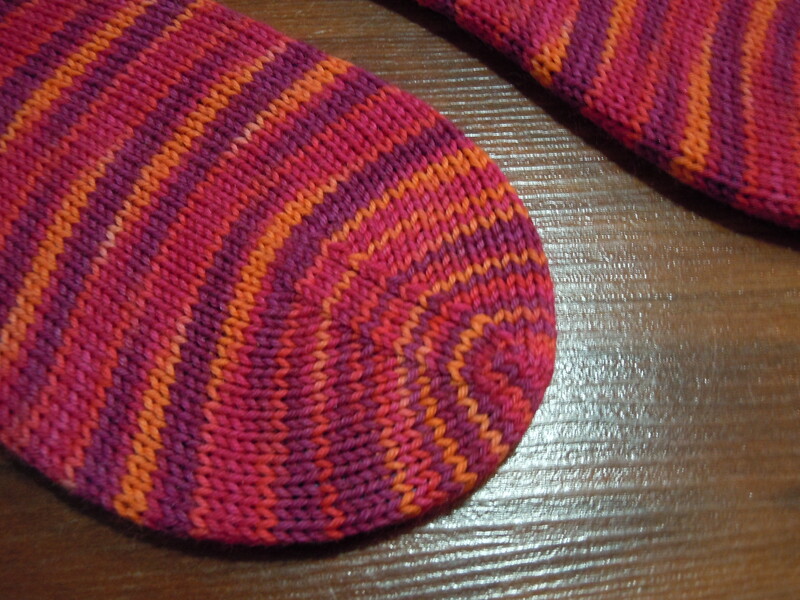 These were knit on size 2 needles (2.75 mm) with Lorna’s Laces Shepherd Sock Multi in “Bittersweet.” I still have quite a bit of yarn left over, so I’m going to try to make some baby socks with the remainder. 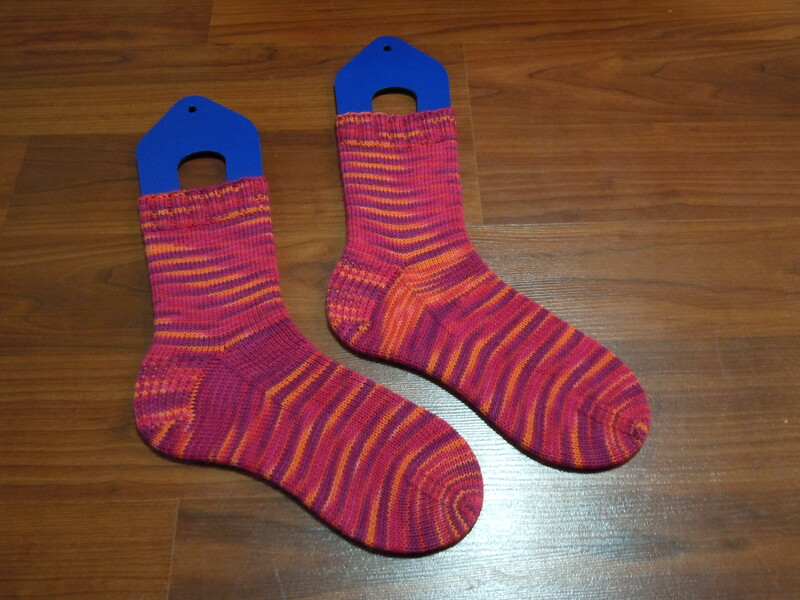 No word on how the yarn holds up, yet, since I haven’t even worn them, let alone washed them.